Aip3p/Bud6p is a regulator of cell and cytoskeletal polarity in Saccharomyces cerevisiae that was previously identified as an actin-interacting protein. Actin-interacting protein 3 (Aip3p) localizes at the cell cortex where cytoskeleton assembly must be achieved to execute polarized cell growth, and deletion of AIP3 causes gross defects in cell and cytoskeletal polarity. Aip3p localization is mediated by the secretory pathway, mutations in early- or late-acting components of the secretory apparatus lead to Aip3p mislocalization (PUBMED:10679021). 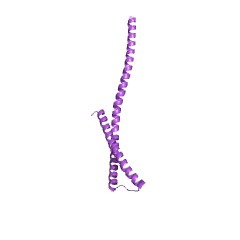 This entry represents the C-terminal domain of actin interacting protein 3 (also known as Bud6 in budding yeasts). 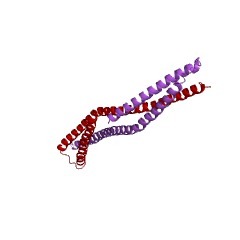 Bud6 is an actin- and formin-interacting protein. The N-terminal half of Bud6 is a microtubule binding domain required for its localisation and for its function in cortical capture of astral microtubule ends. The C-terminal half (residues 489-788) directly facilitates actin filament assembly by the formin Bni1 and is required for NPF (nucleation-promoting factor) activity. The domain represented in this entry (residues 365-776) is overlapped with the C-terminal half of Bud6 in this study [(PUBMED:23161908)]. There are 637 AIP3 domains in 637 proteins in SMART's nrdb database. Taxonomic distribution of proteins containing AIP3 domain. This tree includes only several representative species. The complete taxonomic breakdown of all proteins with AIP3 domain is also avaliable. Click on the protein counts, or double click on taxonomic names to display all proteins containing AIP3 domain in the selected taxonomic class. Role of bud6p and tea1p in the interaction between actin and microtubules for the establishment of cell polarity in fission yeast. BACKGROUND: In many cell types, microtubules are thought to direct the spatial distribution of F-actin in cell polarity. Schizosaccharomyces pombe cells exhibit a regulated program of polarized cell growth: after cell division, they grow first in a monopolar manner at the old end, and in G2 phase, initiate growth at the previous cell division site (the new end). The role of microtubule ends in cell polarity is highlighted by the finding that the cell polarity factor, tea1p, is present on microtubule plus ends and cell tips . RESULTS: Here, we characterize S. pombe bud6p/fat1p, a homolog of S. cerevisiae Bud6/Aip3. bud6Delta mutant cells have a specific defect in the efficient initiation of growth at the new end and like tea1Delta cells, form T-shaped cells in a cdc11 background. Bud6-GFP localizes to both cell tips and the cytokinesis ring. Maintenance of cell tip localization is dependent upon actin but not microtubules. Bud6-GFP localization is tea1p dependent, and tea1p localization is not bud6p dependent. tea1Delta and bud6Delta cells generally grow in a monopolar manner but exhibit different growth patterns. tea1(Delta)bud6Delta mutants resemble tea1Delta mutants. Tea1p and bud6p coimmunoprecipitate and comigrate in large complexes. CONCLUSIONS: Our studies show that tea1p (a microtubule end-associated factor) and bud6p (an actin-associated factor) function in a common pathway, with bud6p downstream of tea1p. To our knowledge, bud6p is the first protein shown to interact physically with tea1p. These studies delineate a pathway for how microtubule plus ends function to polarize the actin cytoskeleton through actin-associated polarity factors. The secretory pathway mediates localization of the cell polarity regulator Aip3p/Bud6p. Aip3p/Bud6p is a regulator of cell and cytoskeletal polarity in Saccharomyces cerevisiae that was previously identified as an actin-interacting protein. Actin-interacting protein 3 (Aip3p) localizes at the cell cortex where cytoskeleton assembly must be achieved to execute polarized cell growth, and deletion of AIP3 causes gross defects in cell and cytoskeletal polarity. We have discovered that Aip3p localization is mediated by the secretory pathway. Mutations in early- or late-acting components of the secretory apparatus lead to Aip3p mislocalization. Biochemical data show that a pool of Aip3p is associated with post-Golgi secretory vesicles. An investigation of the sequences within Aip3p necessary for Aip3p localization has identified a sequence within the N terminus of Aip3p that is sufficient for directing Aip3p localization. Replacement of the N terminus of Aip3p with a homologous region from a Schizosaccharomyces pombe protein allows for normal Aip3p localization, indicating that the secretory pathway-mediated Aip3p localization pathway is conserved. Delivery of Aip3p also requires the type V myosin motor Myo2p and its regulatory light-chain calmodulin. These data suggest that one function of calmodulin is to activate Myo2p's activity in the secretory pathway; this function is likely the polarized movement of late secretory vesicles and associated Aip3p on actin cables.